Despite having lived here for many years, I never fail to be taken aback by the splendor of Barcelona’s panoramas when viewing the city from one of its many vantage points. Whether I am perched on Montjuïc or have taken a trip up to Tibidabo, there is something about the urban sprawl contrasting against the Collserola mountain range and the Mediterranean coastline that is truly majestic and captivating. However, for visitors with limited time it is not always practical to head to the fringes of the city to take advantage of these vistas. But all is not lost – thankfully there are a number of easily accessible roof terraces in downtown Barcelona where it is possible to revel in the surrounding cityscape. Read on for our guide to a few of our favorite venues for drinking in the view, whilst also sipping on a refreshing cocktail – the perfect way to spend a summer evening! Skybar : Grand Hotel Central Expect to experience the wow factor as you step onto deck of the Skybar terrace at Grand Hotel Central, which over looks the El Born (La Ribera) neighborhood below. 360º Terrace : Barceló Raval As the name suggests, this terrace bar enjoys 360º views. So, in the unlikely event that you get bored of looking at the ocean you could simply stroll around to the other side of the terrace to sample the views of the mountains. Alaire Terrace Bar : Hotel Condes de Barcelona Situated on Passeig de Gràcia, Hotel Condes de Barcelona’s Alaire terrace bar provides fantastic views of two of Antoni Gaudí’s masterpieces – Casa Milà (La Pedrera) and Sagrada Familia. 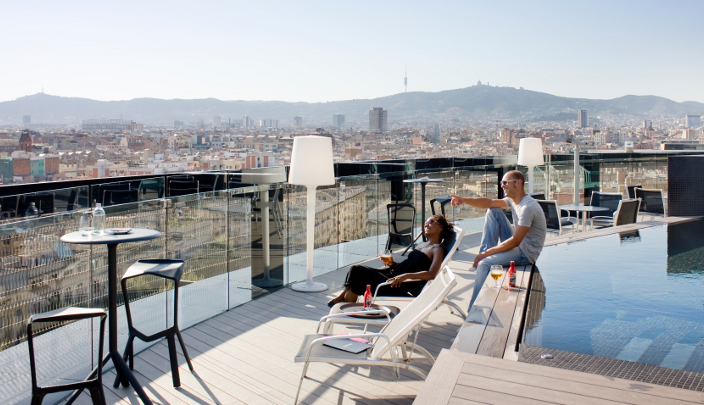 Terraza Chill-Out : Ohla Hotel If you are planning an outing to the Palau de la Musica, we do recommend that you also pay a visit to the nearby Ohla Hotel’s Terraza Chill-Out to take in the views of the Gothic Quarter and Montjuïc in the distance. 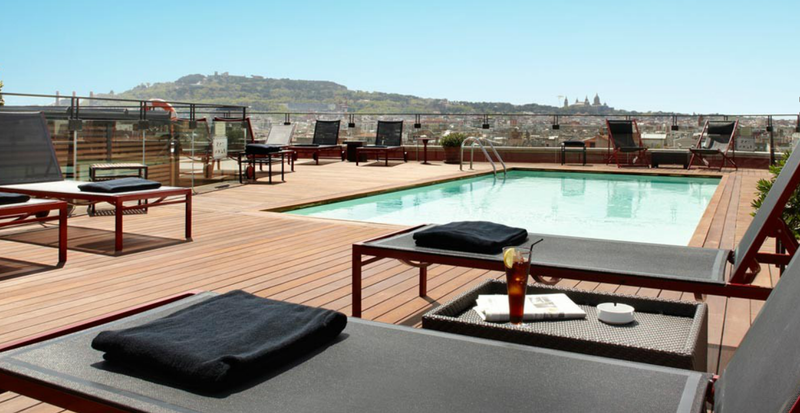 Terrace La Isabela : Hotel 1898 Hotel 1898 is located on La Rambla, Barcelona’s most hectic tourist drag – but you would hardly know once you have entered the oasis of calm that is the Terrace La Isabela. Note: Use of terrace pools are reserved for the exclusive use of hotel residents. This entry was posted in Barcelona and around, Barcelona Hotels, Gaudi Architecture and tagged Antoni Gaudi, Barcelona, El Born, La Ribera, Mediterranean, Palau de la Musica, Panoramas, Passeig de Gràcia, Raval, Roof terraces, summer, Views, Vistas. Bookmark the permalink.